What information may be collected by Tested, and how is it collected? We collect information directly from you that you provide to us when you register on the Site. This information may include your name and email address, as well as any other information specified in the registration process. We may also collect any information you enter on the Site or give us in any other way, such as through an email, survey, user-generated content, promotion, or letter using different types of technology, including, but not limited to, “clear gifs” or “web beacons”. Where allowed by law, we may also collect information about you from other sources. We also collect non-personally identifiable usage information about your use of the Site, such as your browser, links you click, your IP address and the website you visited before coming to the Site. Third Party Web Beacons: We may also implement third party content, such as third party buttons (such as “like” or “share” buttons) or advertising on the Site that may use clear gifs or other forms of web beacons, which allow the third party content provider to read and write cookies to your browser in connection with your viewing of the third party content on the Site or may otherwise allow such third party to collect information about you. This information is collected directly by the third party, and we do not participate in that data transmission. Information collected by a third party in this manner is subject to that third party’s own data collection, use, and disclosure policies. We also use Facebook login so you can use your existing Facebook account to access the features of the Site. You must explicitly authorize Facebook to share your information with us when you first login to the Site with your Facebook credentials. You should review your privacy settings on your Facebook account because those settings determine and govern what PII may be made available to us when you access the Site. While Facebook login allows us to access a variety of information about you based on your Facebook account’s privacy settings, we only access PII which we feel is useful to enhance your experience of the Site, including your name, gender, and location. If you choose to purchase a subscription to Tested, this status will be stored on your profile, along with a transaction number associated with the payment. However, we do not handle or have access to any of your payment information. For questions about how this information is stored and used or about our subscription service generally, please read our Additional Terms of Service and our third party providers’ privacy policies. Please keep in mind that whenever you voluntarily provide information in public areas of the Site, that information can be viewed and possibly used by others. We therefore advise users not to disclose contact information that they do not wish to share, including phone number, email address, street address, instant messenger address, identifying images, etc., within these public areas. We are not responsible for PII you choose to submit in these public areas. Like many websites, we may use “cookies” and other similar technologies, such as pixels, beacons, or 1x1 GIFs. Cookies are alphanumeric identifiers that we transfer to your computer’s or device’s hard drive through your web browser to enable our systems to recognize your browser. We may use persistent, identifying cookies to remember your information and to link your activities to you. While you can take steps to warn off, block, or disable cookies, if you do, the Site may not function and appear as we have designed it. Nonetheless, if you want to take these steps, you can do so by following the instructions associated with your browser. For more information about cookies, including controlling and deleting them, please visit the www.aboutcookies.org website. As mentioned above, we may use persistent, identifying cookies to remember your information and to link your activities to you. In our emails to you, we may use “pixel tags” to determine if your email software or service can display html-formatted email (this helps us optimize the size of our email messages and conserve bandwidth). We may also use pixel tags to understand usage patterns to help deliver content more relevant to you. From time to time, we may host a promotion, sweepstake, or contest on the Site. You may be asked to provide PII or permit the transfer to a third party of your PII, user-generated content, or other information in connection with such promotion, sweepstakes, or contest. It will be disclosed at the point of collection or transfer who is collecting or transferring the information and whose privacy statement applies, and it will be your choice whether or not you wish to permit such transfer or collection of PII or other information to a third party. It is important to protect children on the Internet. Parents and guardians should educate their children about protecting themselves online, teach their children how to safeguard their personal information, and monitor their children’s online activities. We do not intend to and will not knowingly collect information from children under 13 online and, as stated in our Terms, children under 13 are not allowed to use the Site or sign up for a member account. If you are a parent or guardian and discover that your child under 13 years-of-age has obtained an account on the Site, then you may alert us at privacy@bermanbraun.com and request that we delete that child’s personally identifiable information from our systems. 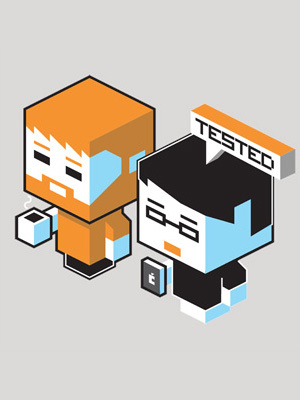 What Does Tested Do With Collected Information? You can unsubscribe from any newsletters or opt-out of various promotional emails you may have consented to at any time by clicking on the “unsubscribe” links in each of our newsletters or emails. We reserve the right to send you customary business communications such as acceptance/rejection notices regarding content submissions, general system and administrative messages regarding the Site, address confirmations, and transactional information about your account, and we may not offer you the opportunity to opt-out of receiving such communications so long as you are registered with the Site. We use non-PII about our users for purposes such as, but not limited to, measuring the number of visitors to sections of our Site, making the Site more useful to visitors, and delivering targeted advertising and non-advertising content. We use IP addresses to analyze trends, administer the Site, track a user’s movement, and gather broad demographic information for aggregate, non-personally identifiable use. We retain information for as long as required, allowed, or we believe it useful, but do not undertake retention obligations. We may dispose of information in our discretion without notice, subject to applicable law that specifically requires the handling or retention of information. You should keep your own, separate back-up records. Subject to the terms of this Policy, we reserve the right to the following worldwide: use, access (or bar access to), process, disclose, display, share, transfer, store, sell, retain, commingle, investigate, verify, prove, and otherwise deal with, voluntarily or as required by law, (collectively “Disclose”) all PII, non-PII, and other information. We may Disclose the foregoing internally, to third parties, or through any databases for any purpose not prohibited by this Policy or, in our discretion, to help prevent or address perceived harm, damage or loss to us or others or to respond to subpoenas, search warrants, court orders, or other legal process. We reserve the right to send you customary business communications (i.e. acceptance/rejection notices regarding content submissions, general system and administrative messages, etc.) without offering you the opportunity to opt-out of receiving them. However, we provide you with the opportunity to elect not to receive other types of communications, promotional email and newsletters. Does Tested Share Information With Other Parties? We share non-PII with advertisers, service providers, and other persons with whom we conduct business. Similarly, these advertisers, service providers, and other persons may share information with us, including PII, about you that they have independently gathered or acquired. We contract with affiliated and non-affiliated third parties to provide services to us or to you on our behalf. Examples include providing marketing assistance, providing customer service, processing payment information, sending emails to you, removing repetitive information from customer lists, and analyzing data. These third parties may have access to your PII, but will be required to use this information solely in connection with these authorized business activities. As we develop our business, we might buy or sell businesses or their assets, or engage in transfers, acquisitions, mergers, restructurings, changes of control, or similar transactions. In such transactions, customer information generally is one of the transferred business assets and your PII may be subject to such a transfer. Also, in the unlikely event of a bankruptcy, PII may be transferred to a bankruptcy trustee or debtor in possession and then to a subsequent purchaser. We may share PII, non-PII, and other information with our corporate affiliates. Corporate affiliates are those entities that we control, are controlled by us, or are under common control with us as well as any joint venture in which any of the controlled entities may participate from time to time. Any use of your information by our corporate affiliates is subject to this Policy or another policy no less protective of your privacy. Conversely, we may obtain information about you from our corporate affiliates or from your visits to other websites that we or our corporate affiliates control. protect the rights, property, or safety of the Site, our users, or others, including exchanging information with other companies for fraud protection and credit risk reduction. You must protect against unauthorized access to your password and to your computer or device. Please sign off when you have finished using a shared computer or device. Your emails to us are not necessarily secure against interception so do not include sensitive information in them. We will not ask for passwords in an email and you should assume that if you get such a request, it might be fraudulent. YOU MUST DO WHAT YOU REASONABLY CAN TO ENSURE THE SECURITY OF YOUR PERSONAL INFORMATION. We take reasonable precautions to protect the security of your information. We have physical, electronic, and managerial procedures to help safeguard, prevent unauthorized access, maintain data security, and correctly use your information. However, neither people nor security systems are foolproof, including encryption systems. In addition, people can commit intentional crimes, make mistakes, or fail to follow policies. Therefore, while we use reasonable efforts to protect your PII, we cannot guarantee its absolute security. If we learn of a security systems breach, then we may attempt to notify you electronically through the email address you have provided to us so that you can take appropriate protective steps. We may post a notice through the Site if a security breach occurs. Depending on where you live, you may have a legal right to receive notice of a security breach in writing. The Site contains links to other websites. We are not responsible for the privacy practices of such other websites. We encourage you to be aware when you leave the Site and to read the privacy statements of every website that collects your PII. This Policy applies only to information collected by the Site. We reserve the right to change our Policy at any time. Non-material changes and clarifications will take effect immediately. If we make non-material changes, we will indicate at the top of this page the revised Policy’s new effective date. If we make material changes, we will notify you by email (at the email address you have provided to us) or through notice on the home page of the Site, and will also indicate as much at the top of this page. The material changes will take effect 30 days after such notice. We encourage you to refer to this Policy at least every 30 days to check for material changes. The Site is hosted in the United States. If you choose to use the Site from the European Union or other regions of the world with laws governing data collection and use that may differ from United States law, then please note that you are transferring your personally identifiable information outside of those regions to the United States for storage and processing, and by providing your personally identifiable information on the Site you consent to that transfer, storage, and processing. We may limit the availability of the Site or any service or product described on the website to any person or geographic area at any time. If you choose to access the website from outside the United States, you do so at your own risk. If you live outside of the United States, you understand and agree that we may transfer your information to the United States. Our website and Site is subject to United States laws, which may not afford the same level of protection of those in your country. What If I Have Other Questions Or Concerns About Privacy Or This Policy? We utilize the self-assessment approach to assure our compliance with the Policy. We periodically verify that the Policy is accurate, comprehensive for the information intended to be covered, prominently displayed, and completely implemented. We encourage interested persons to raise any concerns with us using the contact information below. We will investigate and attempt to resolve complaints and disputes regarding use and disclosure of PII in accordance with the principles contained in this Policy. If you have any concern or complaint about privacy on the Site, please contact us at BermanBraun, Attn: Business & Legal Affairs, 2900 West Olympic Boulevard, Third Floor, Santa Monica, California 90404, U.S.A or email us at privacy@bermanbraun.com. We will do our best to respond to you in a timely and professional manner in order to answer your questions and resolve your concerns. For customer service matters (including questions relating to this Policy), you may email via our contact form. Tested is a trademark of BermanBraun in the United States and other countries.